A natural pool, known as Big Pool, begins at mile 112.1. At roughly 1.5 miles long, it was a convenient turning point for canal boats. Big Pool is a natural depression that was filled with water during C&O Canal construction. Within Fort Frederick State Park, Big Pool is a popular fishing and boating site, and though there is a boat ramp, gas motors are prohibited. 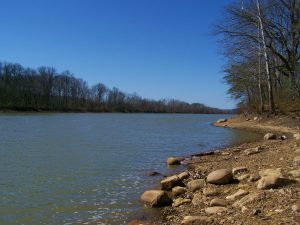 It is primarily a warm water fishery, meaning good fishing for species such as largemouth bass, catfish, carp, bluegill, etc. Big Pool is lined with cornfields which allows for wildlife watching, particularly deer.